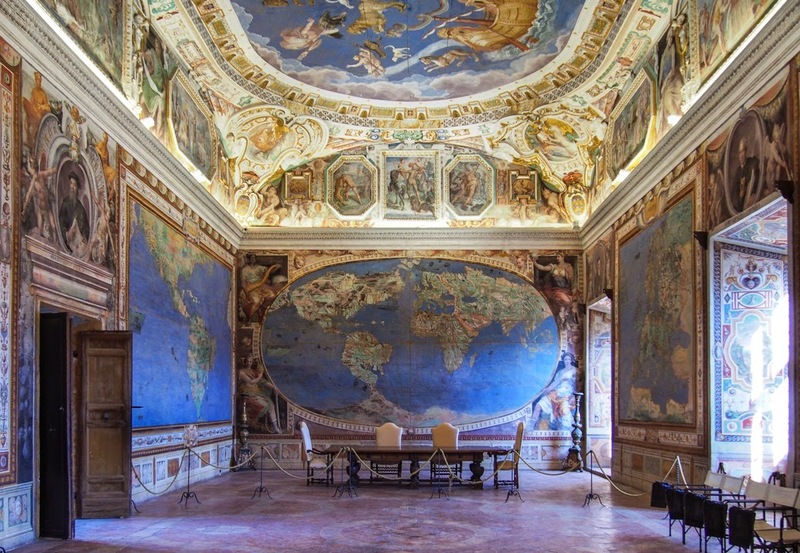 A stunning Renaissance palace, covered with art from floor to ceiling. This massive building gives most of the famous palazzi in Rome a run for their money. Filled with some of the best examples of Renaissance and Mannerist art in Italy, you will have this palace practically all to yourself. 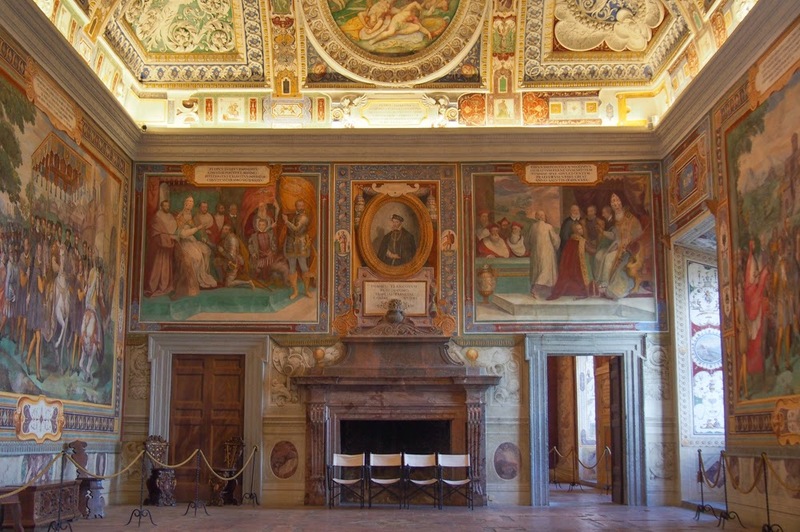 If you like painting and Renaissance art, the Farnese family's humble abode will not disappoint. 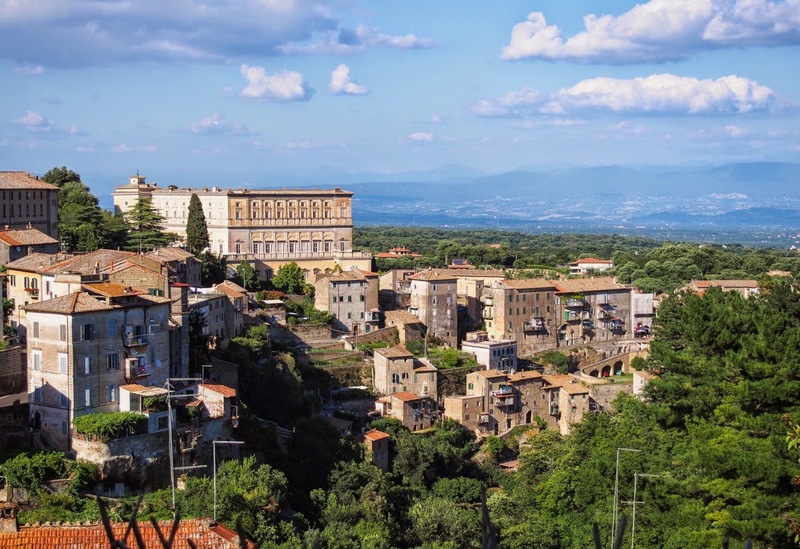 The little town of Caprarola, day-trip distance (about 70km) from Rome, and 20km from Viterbo. Map. 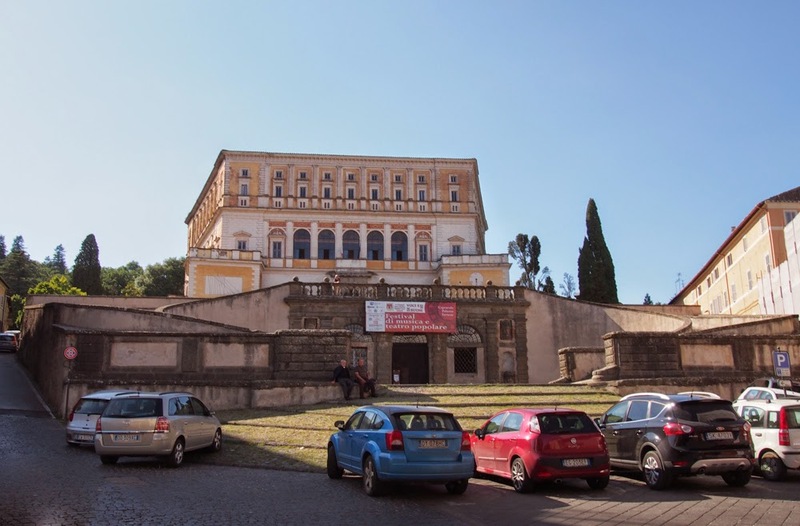 THE FARNESE FAMILY played a crucial role in a well-known Italian organization of mixed repute, with its power base firmly set in the southern half of Italy and a growing international footprint. The Farnese clan was one of the more powerful families within this organization, with its own territory clearly staked out, offering protection (or else...) in return for cash. But when Alessandro Farnese was made Capo di tutti Capi, the family's fortunes rose even further, as he became one of the most powerful men in Europe. He aggressively promoted the interests of La Famiglia and dealt ruthlessly and violently with those who opposed him and his organization. I am talking of course about the Roman Catholic church and Farnese's election to the Papacy in 1534. During his reign, as Paul III, he stuffed the family coffers and reinvigorated the Inquisition to deal with the Reformation. He also put the word 'nepote' in 'nepotism', by, barely 2 months into his papacy, awarding two of his 'nephews' (nepote in Italian, but since cardinals and popes were not supposed to be married, these 'nephews' were often (illegal) offspring) with cardinalships at the wise ages of 14 and 16. The Farneses weren't shy about nepotism. 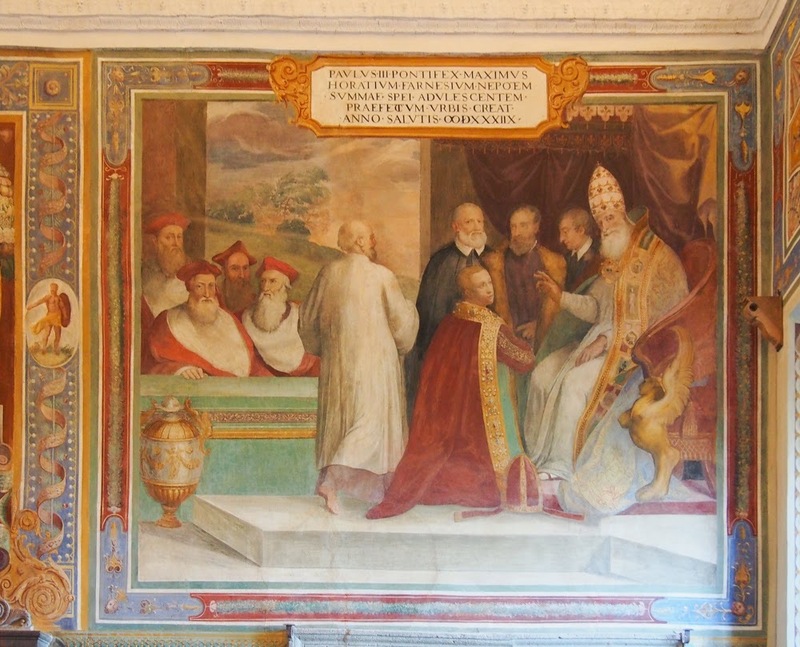 This fresco from one of the palace walls shows Pope Paul III Farnese bestowing a title upon one of his nepoti. 'Godfather' Pope Paul III and his grandson, Cardinal Alessandro Farnese, were responsible for turning this site into the palace we see today. ...and as seen a few 100 years ago, painted inside the palace's entry hall. 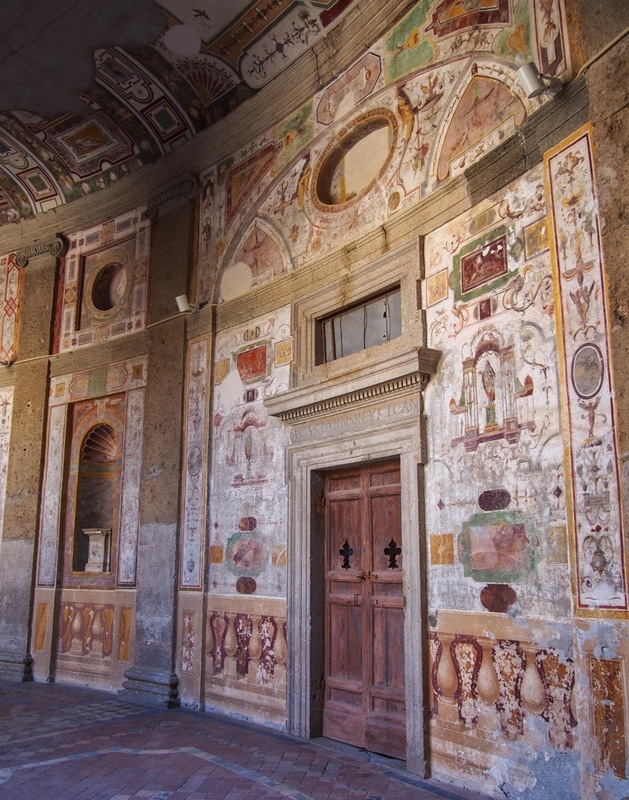 There are numerous painting styles on display inside, almost all of them frescoes, on a scale that makes the Sistine Chapel look like a country chapel in comparison. A staircase fit for a king, pardon, pope. The ground floor and magnificent staircase is mostly done with grotesques. These were inspired by the ancient Roman decorations that late 15th century artists discovered in 'grottoes' in Rome- in reality, the remains of emperor Nero's Golden House on the Palatine Hill in Rome. 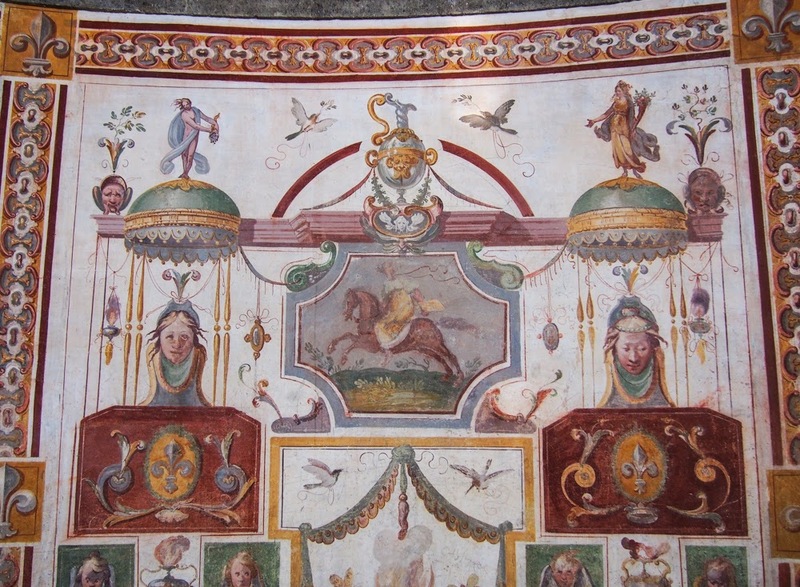 Roman-inspired 'grotesque' frescoes in the staircase. Warning: if you like your interior decoration minimalist, this place is not for you! Upstairs on the main floor (the piano nobile), the numerous rooms are dedicated to various themes. 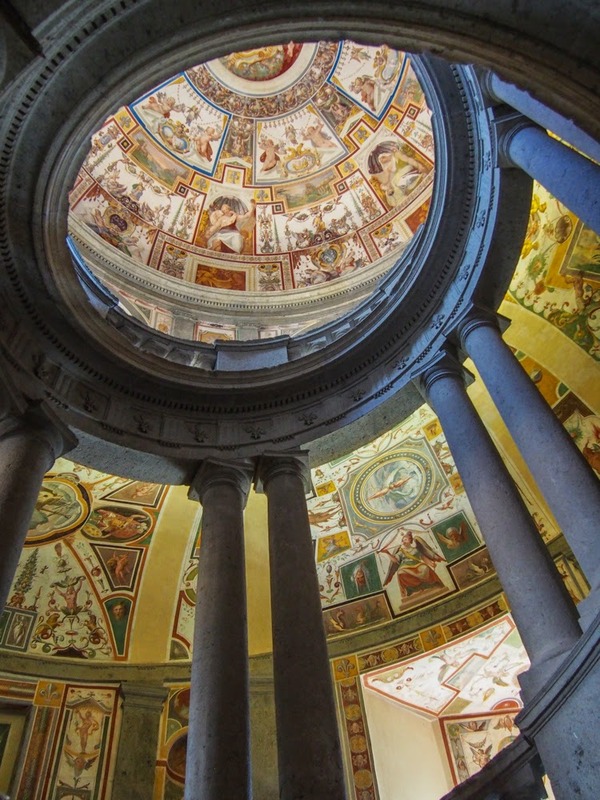 All of them feature wall-to-wall frescoes and decorated coffered ceilings. 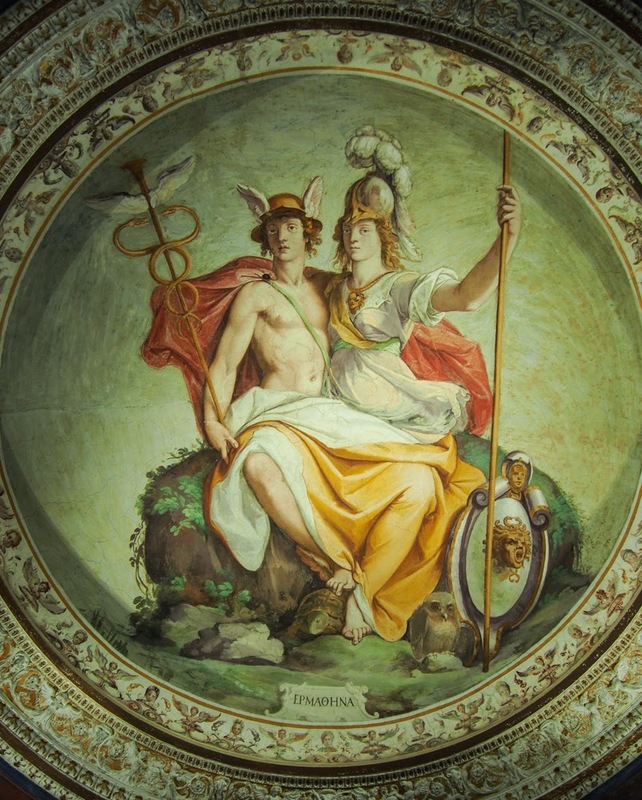 Some of the rooms feature classic themes and stories: the works of Hercules, ancient philosophers, and a gorgeous Mercury and Minerva grace the ceiling of another chamber. My personal favourite: Mercury and Minerva. 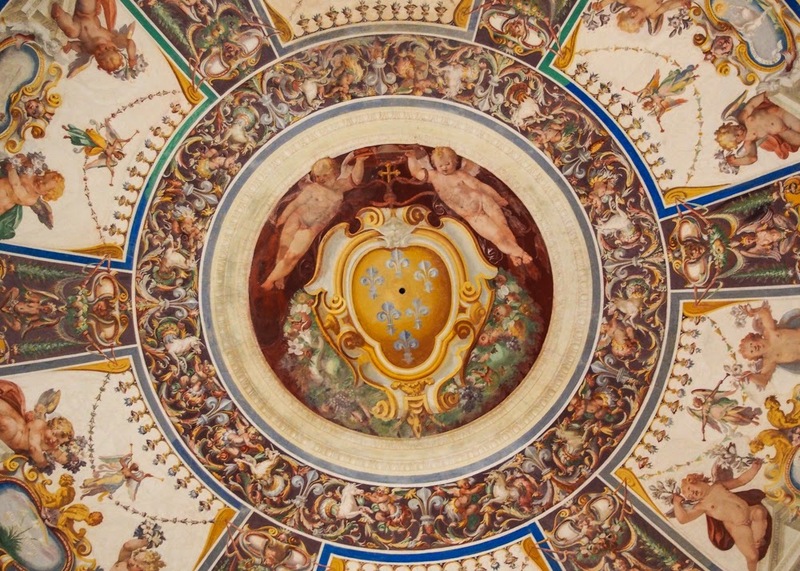 Never shy to blow their own horn, one room celebrates the achievements of the Farnese family. 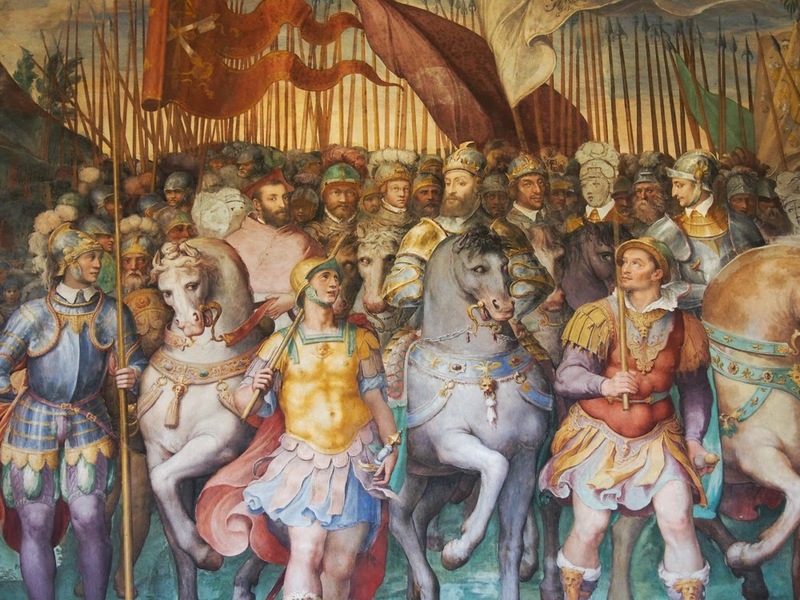 This includes the nepotism fresco shown above, as well as numerous images that show Paul III and Cardinal Alessandro in various 'meet & greet's with 16th century celebrities like Emperor Charles V and French King Henry II. Alessandro Farnese chilling with his mates, the Holy Roman Emperor Charles V and Henry II of France, ready to squash the Protestants. The most magnificent of all is undoubtedly the map room. The maps are surprisingly detailed and accurate- see if you can find your home town! The Palazzo dominates the tiny town of Caprarola. 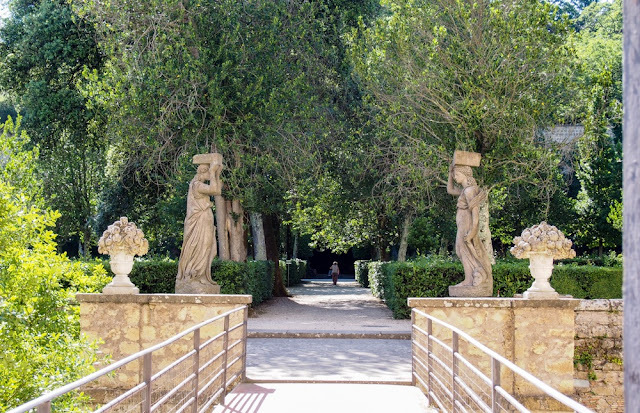 The Palazzo also has some stunning gardens- you will pass through them on the way out. Be sure to check out the grotto with satyrs and a refreshing waterfall at the back of the garden. However, the largest part of the garden is not visible and must be visited separately. At the time of writing, visits were only possible on weekdays between 10-11h and 12- 15h. Current opening hours can be found here. 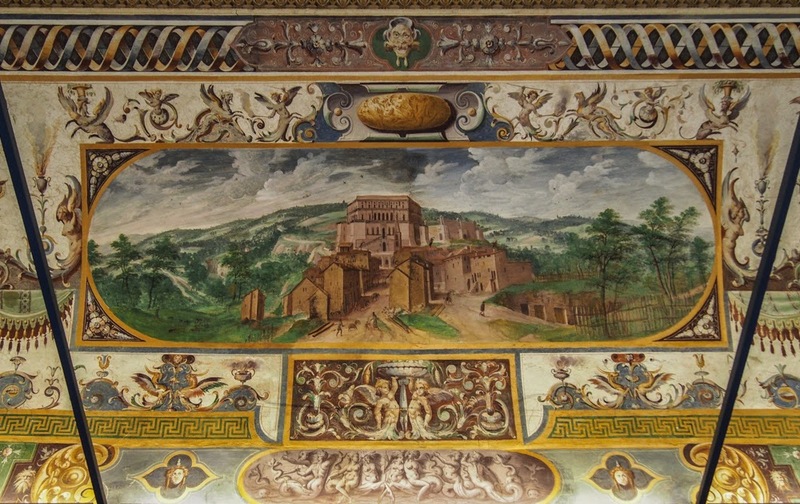 Caprarola is about an hour's drive north of Rome, following the ancient Via Cassia. Or there are 6 COTRAL buses a day from Viterbo. There are several other great gardens in the area- for more on them, check out our post about 4 Renaissance gardens near Rome on Lazio Explorer.